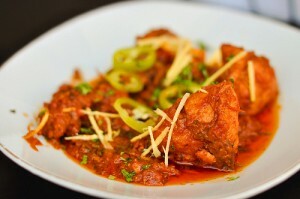 Chicken Karahi recipe by Mona at DesiRecipes.com. In a karahi or a big pot heat oil, put chicken and garlic fry it till it becomes golden brown. Now add ginger , garam masala, crushed dry red peppers, salt , red chilli powder and tomatoes. Do not cover the pot, cook it on mediam flame till the chicken is tender. Now put dry methi leaves and three or four green chillies and cook it till oil seems to be separated. Cover the pan. Put it on simmer for few minutes. Garnish it with rest of the green chillies and hara dhania and some garam masala, sprinkle lemon juice and serve with nans.